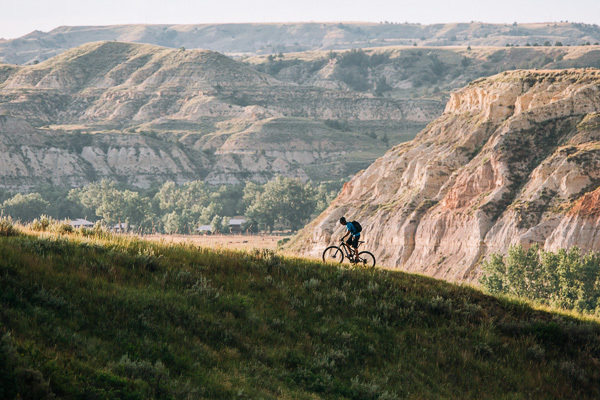 The Buffalo Gap Trail goes around the South Unit of Theodore Roosevelt National Park (TRNP). This trail was developed as an uninterrupted single track mountain bike trail to Sully Creek Campground. The trail crosses Knutson Creek with a hardened low water crossing and numerous long rolling grasslands areas. The trail goes just south of the Buffalo Gap Guest Ranch, and accesses the Buffalo Gap campground on a short spur trail. The Buffalo Gap Trail intersects the Maah Daah Hey Trail north of TRNP between Mile Posts 61 and 62. and south of TRNP between Mile Posts 49 and 50.